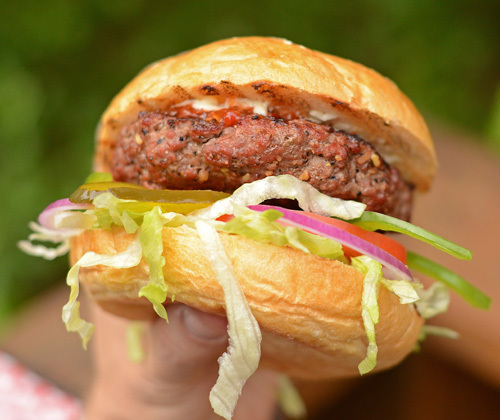 Want to elevate your backyard burger to the next level this summer? Here's an idea that hit me at lunch yesterday. Take your favorite sub sandwich ingredients and use that to dress your burger! I can't think of too many subs that wouldn't make a great burger topping. Club burger? Absolutely. Roast beef and Swiss burger? Sure. Prosciutto, salami, and capicola burger? Sounds great. For me, my favorite that I eat a few times a week at work is the Veggie Sub from Lenny's Sub Shop. I know that isn't much different than ordinary burger toppings but the three things that rock it up a bit are 1) oregano, 2) thin sliced green bell pepper, and 3) that hot red pepper relish. Preheat a charcoal grill to 450-500f. Mix the ground beef and burger seasoning together. Divide into 6 equal portions and form into patties about 1" thick and 4-5" in diameter. Grill over direct heat until juices begin to pool on top, about 3-4 minutes. Flip the burgers and cook until they reach an internal temp of 165f, about 3-4 minutes. Top with cheese in the last minute. Note about internal temps: I advise against cooking burgers below 165f UNLESS you sterilize and grind the beef yourself. I'm a little wary of commercial burger seasoning mixes. Instead of enhancing a burger, some mixes are too strong and make the burger taste like a sausage instead of burger. So I was not sure how I would like the new Grill Mates Worcestershire Pub Burger Seasoning that McCormick sent me recently. The ingredient list is basic - spices, salt, dry Worcestershire, garlic, toasted onion and citric acid. No unpronounceable weird stuff in there. The strong aroma is unmistakably that of Worcestershire sauce and onion. The texture is quite coarse with large chunks of onion, garlic, and pepper, living up to the Grill Mates tagline, "Flavor you can see". Turns out that we liked it a lot. It adds and enhances the flavor of the burger but doesn't take over. As bold as the seasoning is, it translates to a good burger. You can also use it in steaks and I think it would rock in meatloaf. Hmmmm that's an idea, I could go for a meat loaf sandwich. We'll be picking up another jar when this one runs out. Here's another tip for dressing your burgers up. Customize your condiments! 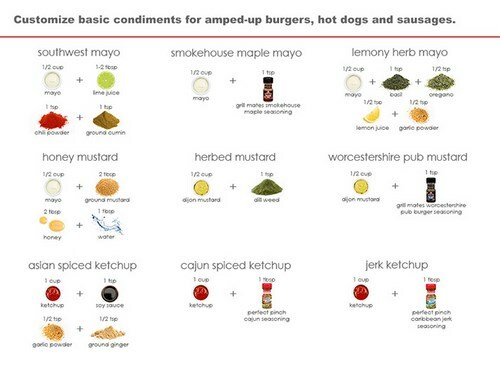 McCormick recently released their Flavor Forecast - Grilling Edition for 2013 and one of the trends is "do it yourself condiments". Here is a quick guide that I stole from their forecast McCormick has graciously provided for some ideas. Do you have a favorite "special sauce" that you like to mix up for your burgers? [Standard Disclaimer] I received samples from McCormick for review; however, no other compensation was received for this post.